Global auto giant Audi has appointed Uwe Hermann, a regional industry veteran, as the sales director for the Middle East region. In his new role, he will lead the sales for the Audi brand across 11 countries, 12 importers and 24 dealer facilities in the GCC and Levant region, said a statement from Audi. As an automotive professional with extensive international experience, Hermann has worked in the Middle East for more than 16 years. He joins the brand with the Four Rings from its sister company Porsche, where he was senior regional sales manager. 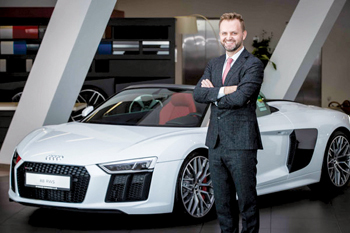 Operating from the AVME regional office in Dubai, Hermann will be responsible for driving the growth for the Audi brand in the Middle East. “Audi Middle East has an exciting future ahead with a wealth of innovative new models arriving over the next few years,” said an excited Hermann.